The bedding of babies and children, as well as anyone who suffers from illness or disease, should be disinfected on a weekly basis. Repeatedly becoming sick with the same illness can be a sign that a person is recatching the illness from the bedding they lie on. This indicates the bedding needs to be cleaned more often and more thoroughly. To properly clean and disinfect bedding, more than just the sheets must be laundered. Disinfecting can be done with things you probably already have in the home. Strip the bed of all pillows, pillowcases, sheets, comforters and shams. Even take the dust ruffle or entire crib set off of the sleeping area and load them into the washer according to colors. If you have all whites, load them all in at once. If you have colors and whites, load the colors in the first wash and then wash the whites separately. Turn the washer to the hot-wash, cold-rinse cycle for laundering colors and whites. If you have thick sheets and blankets, use a setting for hot wash and cold rinse on heavy wash. This will be sure to scrub out any of the lingering bacteria. If you do not have a hot-wash, cold-rinse cycle on your washing machine, set it to the hottest wash cycle you have. Measure the laundry detergent and bleach (either regular or color-safe, depending on the bedding in the washer) per manufacturer instructions. Pour these into the washing machine and start it. Remove the bedding from the washer once the cycle is complete and load into the dryer. Dry on the hottest temperature, which is permanent press (it is normally found on old and new dryers). 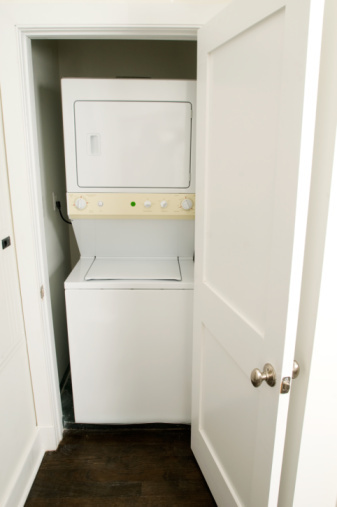 Move your heat selector to permanent press and dry for at least 1 hour. Check the laundry for dryness, and leave in the dryer for 20 minutes after the fabrics are completely dry to kill any remaining bacteria. Then replace on the bed.